Belarusian youth studying abroad have three days left to send their applications to participate in the annual Rally of the United Students of Belarus, which will take place in Lithuania on 1-5 October 2014. Young people studying abroad and in Belarus will meet for the eighth time to exchange contact information and share their academic and personal experiences. Since 2007 the project has become the largest group of alumni of young Belarusians living abroad. The rally offers a chance for informal and formal ideas to be presented about the future of Belarus. During recent years, Belarus has become a country of young emigrants and this trend is set to continue. The United Students of Belarus link these people together and can play a big role in the future of the country, including potential future changes in the political establishment. The Vilnius-based Eastern European Studies Centre, based in Vilnius, serves as an organiser of the event. It would be fair to call Belarus a country of emigrant students. Belarusians have a university in exile – European Humanities University, and a large number of scholarship programmes exclusively for Belarusians that help they study abroad. The Kalinowski Scholarship and the ​​European Scholarship Scheme for Young Belarusians remain the most prevalent in terms of the size of their programmes. The first programme offers education for youth that have dealt with repression, while the other is for all Belarusians. Moreover, thousands of Belarusian students receive education through smaller schemes, college scholarships, or pay their own way. The number of Belarusian students abroad, by all indicators, will only increase in coming years. According to a survey by the Belarusian Institute of Strategic Studies, only 13.7% of young Belarusians do not want to leave the country to study or work. Many remain reluctant to return to Belarus as they do not see any prospects for themselves. This is why the United Students of Belarus remains the only inclusive platform for Belarusian students and graduates abroad. Besides USB Rallies, alumni of Kalinowski Scholarship or graduates of British universities organise meetings now and then, but these events lack regular gatherings and remain rather exclusive events. In comparison, Ukraine has dozens of such associations of professionals who have been educated in the West. Ukrainians usually integrate into clubs of university graduates, like the Harvard Club of Ukraine or the Association of Fellows, or as alumni of the Fulbright programme. Today, these clubs have become the core of the Professional Government initiative involved in the replacement of corrupt officials with young Ukrainian experts. It is possible that the United Students of Belarus will once play a role in building a new government in the country. The first Rally of the United Students of Belarus took place in 2007 and tried to support the emergence of an informal network of the country`s future leaders. The rally played a large role insofar as it helped maintain connections between Belarusians stranded abroad after the wave of repression in 2006. After the presidential elections, the authorities expelled hundreds of students from universities. The project has become the most extensive network of young Belarusians who live both in Belarus and abroad. Belarusian students from over 15 countries participate in the project and every year about 50-60 people come to the rally to share their ideas and network. USB participant Zhenia Tsikhanovich admits that ‘in the course of just one Rally people build a new network of Belarusians throughout whole Europe and the US’. Since 2007, about 300 Belarusians have attended the rally, and some people try to attend the event every year. The author of this text met the editor of Belarus Digest during the 2012 USB gathering. The Rally brings together two worlds of Belarusians – those who remain in country and those who have emigrated. It is noteworthy that the students abroad and those residing in Belarus lack a single major organisation or association that can bring them together. The United Students of Belarus fills this gap. The event program combines work and fun in the form of the intellectual debate or concerts by popular Belarusian groups. Each rally has its own theme. Organisers and the USB Community devoted the 2014 Rally to the development and promotion of multicultural dialogue and the maturation of Belarusian identity. The USB has a good reputation not only among young Belarusians. Representatives of the Lithuanian authorities, Western diplomats located in Vilnius and NGO staff attend rallies to share their views on the future of Belarus with young leaders of the country. Aivaras Žukauskas, coordinator of Rally 2014 said that besides opening ceremony with high-profile officials, one seminar about constructing of an image will be conducted by well-versed diplomat. Belarus has long been affected not only by the lack of formalised structures of students and graduates, but also bringing together new generations of Belarusian emigres. 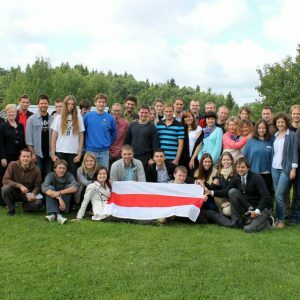 Last year USB participants launched a new organisation – the Global Belarusian Leaders. The organisation is going to recruit new members from among young and perspective Belarusian professionals from all over the world. However, this organisation, as is often true of most emigre organisations, has failed to remain active over a long period of time. The GBL is just one example of the new ideas popping up within Belarusian civil society, but still faces the typical problems associated with the Belarusian community. For one, new emigre organisations tend to become too politicised, as they usually unite around a particular political group. Such structures fail to attract a large number of people. Traditional emigre communities appear to be too old-fashioned, so they cannot offer new emigres incentives to build networks. Therefore the United Students of Belarus has set before itself the serious task of inventing new fresh ideas that will connect Belarusians from the world over. On 11-12 August the Belarusian authorities announced three upcoming legislative initiatives – all intended to complicate the life of state officials. They include a new anti-corruption law, an abrupt reduction in the number of civil servants and a presidential decree, limiting career prospects for state managers who fail to comply with the government's economic plans. These three measures appear to be setting a new trend: Aliaksandr Lukashenka, disappointed with his administrative vertical power structure, decided not to punish his subordinates, but instead to shake up the ranks. He also needs popular anti-bureaucracy reforms to raise support before the 2015 presidential campaign season begins. But it is precisely because of these upcoming elections that the Belarusian ruler will stray from becoming too radical in putting pressure on officials. He needs them to retain his post. The first reform, announced on 11 August, suggests that there will be job cuts among Belarusian bureaucrats. Lukashenka said he wanted to curtail the unnecessary functions of the officials and thus dismiss half (!) of them and raise salaries for those remaining. Such an ambitious plan looks particularly odd if one recalls that in 2013 a quarter of civil servants were cut under a reform with an identical goal. The following day a draft anti-corruption law was published for public debate – an extremely rare practise in Belarus. In July 2014 Lukashenka himself requested this bill introduction after a number of high-ranking officials came under fire from corruption charges. Among them – the heads of state holdings "Belnaftahim" and "Bellkaapsaiuz" Ihar Zhilin and Siarhei Sidzko, deputy prosecutor-general Alyaksandr Arkhipau, ex-mayor of Homiel, Belarus' second largest city, Viktar Pilipets and several others. Lukashenka even convened two unscheduled sessions of the upper chamber of the Belarusian parliament, the Council of the Republic, to deprive its members – Hanna Shareika and Vitali Kastagorau – of their immunity, when courts needed to arrest them, allegedly, for charges of corruption. The draft law introduces certain additional restrictions for civil servants, such as making it illegal to possess shares in a company. Corrupt officials will permanently lose the right to hold public office and the state will deprive them of receiving a higher-tier pension. Additionally, all bureaucrats and their family members will have to declare their incomes and cost of assets. The very same day Lukashenka announced his third, closely related, novel legislative initiative in his battle with Belarus' bureaucracy. He ordered his administration to draft a presidential decree to ban any bureaucrat or senior-level manager of state enterprises who had failed to fulfil their pre-established targets, outlined in the government's economic plan, from holding any managerial position both in state-owned and in private companies. This latter norm seem to contradict the Constitution of Belarus (private firms are supposed to be free to hire whom they please), though this has rarely prevented Alexander Lukashenka from adopting new, less than legal, regulations whenever the need arised. All three measures, announced almost simultaneously, mean that the Belarusian ruler has once more decided, as he called it in 1990s, "to shake up the bureaucracy". In fact, all the three of the aforementioned upcoming "reforms" appear to be a response to the their predecessors' failures. In 1994 Lukashenka came to power by exploiting an image of himself as being a relentless fighter against corruption. As an MP he headed the anti-corruption commission in parliament and he became extremely popular by exposing bribery in the Belarusian government's ranks. But Lukashenka has never generally succeeded in carrying out a real anti-corruption campaign. In 2013 Transparency International ranked Belarus 123rd in its annual Corruption Perception Index alongside the Dominican Republic, Guatemala and Togo. This latest series of high-profile corruption scandals only further supports their findings. Corruption remains a serious issue in Belarus. As for the sheer number of civil servants employed by the state, the Minsk-based think-tank "Liberal club", in a review of the outcomes of the previous culling of the bureaucracy in 2013, concluded that the reforms also failed to bring about any real change. Authorities often simply just voided new vacancies instead of firing members of their staff. This phenomenon has led to many local administrations not having the requisite specialists in many areas and an overall decline in the quality of governmental agencies' work. With regards to the potential ban on hiring delinquent state managers to public or private managerial posts, this seems to be a response to the government's failed attempt at modernising Belarusian industry, a fact that became all too apparent in 2013. In fact Lukashenka's strategy of clamping down on officials by itself cannot resolve any of these problems. Having too many civil servants, who appear to fail to comply with official governmental plans, owes much to the absence of an established market economy in Belarus. Overregulation by scores of poorly qualified bureaucrats cannot even theoretically be more effective than private management. To combat corruption, the government has also to lessen its role in the economy. Currently state-owned enterprises produce about 70% of Belarus' GDP (according to IMF reports) and the regulatory bodies control the rest of privately owned business. This naturally creates numerous incentives for officials to use their vast powers improperly. A thorough anti-corruption policy should include strengthening democratic institutions and public oversight over the government. Such a policy would include bolstering several important pillars of a democratic society: a free media, independent courts, influential political opposition. None of the above, however, are acceptable components of society to the Belarusian authoritarian regime because its political future depends on maintaining complete control over the nation's politics and economy. 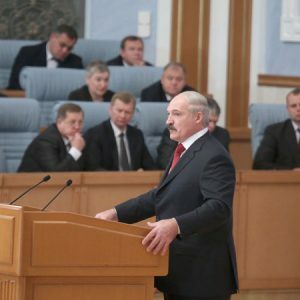 Many Belarusian analysts tend to explain Lukashenka's efforts to shake up his state apparatus not only by its failures, but also in terms of the upcoming presidential elections in 2015. In previous election years (2001, 2006 and 2010) the Belarusian head of state has managed to guarantee the majority with an appreciable, stable growth in their personal incomes in the months leading up to the elections. These days, however, the situation has changed. The GDP grew less than 1% in 2013, the same is being forecasted for 2014 by the IMF and the European Bank for Reconstruction and Development. Contrary to Lukashenka's promises (dating back to 2010) to raise the nation's average salary to $1,000 by 2015, it has just reached $600 as of August 2014. The National Bank predicts Inflation remains in the double-digit and will be about 16-17% by the end of the year. In the absence of economic resources to fuel public support Aliaksandr Lukashenka has deferred to other available ideological levers of gaining the public's backing. For one, he has focused on the peace and stability existing today in Belarus, as compared to the post-revolution chaos and war seen in Ukraine. Independent polls showed it has worked: Lukashenka's level of support has grown throughout the Ukrainian conflict. But the instability in Ukraine will someday subside and, at the same time, Belarusians are slowly becoming accustomed to the conflict south of their borders. Now, then, is the time for a whole new energising campaign. A serious fight against corruption and the bureaucracy in general has always been, and will always be, popular among voters. Thus, a ruler can redirect people's dissatisfaction with the nation's economic failures that have been aimed at him personally to his subordinates and regain public support through this misdirection. However, Lukashenka depends on a loyal bureaucracy to retain his position. It is ironic, but the very event that caused this latest anti-bureaucracy push – the 2015 presidential elections – is the best guarantee that any reform in this direction will be neither intense nor radical.